Wow, You’ve Got Something There! – I love Peppadews! There are restaurants I will never be able to faithfully review since I won’t be able to eat much at them. I can’t handle spicy foods and it’s simply not a case of developing tolerance. I tried that – the chillies overwhelm my prescription heartburn medicine and I got insomnia for days due to severe acid reflux. Never again! Not only do I miss out on these exciting new eats, the closest veggie pepper I get to consume is the pedestrian Bell Pepper. However I think I found a cool non hot pepper to call my own. I introduce the Peppadew! This little sweet pepper hails from South Africa and is a type of Capsicum baccatum (thanks Wikipedia). They are the size of cherry tomatoes and are pickled. Peppadew is the brand name, similar to how acetaminophen is almost exclusively known by its brand name, Tylenol. The peppers themselves are sweet with sour tang from the pickling and slight hint of heat. These peppers are pickled to reduce the their spiciness and this version is the only kind I’ve seen commercially available for purchase. 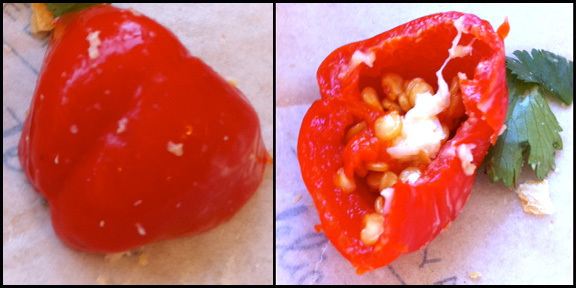 I first discovered these exotic (at least to me) peppers, on my trips to the Dirty Apron Deli. 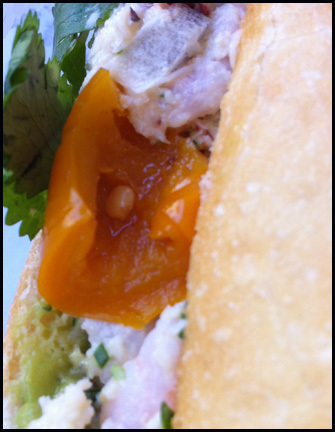 Peppadews top the crab & shrimp salad baguette that is freshly made upon order. In addition to the already mentioned ingredients there is also avocado and cilantro to complete the ensemble. The baton like bread is crusty but give way to a spongy interior. 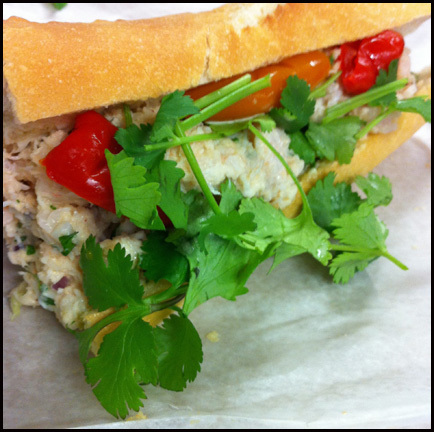 The crab and shrimp is mixed with minced parsley, red onions and mayo. Although you can tell it’s not freshly shelled crab meat, both it and the shrimp have that distinct sweet with a slight briny seafood taste. In addition to the creamy mayo, the avocado adds another level richness. With the exception of the either love it or hate it cilantro (which added some texture), the overall sandwich is quite mild and understated in taste. The Peppadews added the most flavour. Its burst of sweet and sour added a need punch to the sandwich. These South African peppers are what make the sandwich for me. I look forward to seeing how else Peppadews can be used in cooking beside being a tasty condiment (stuffed would be cool in a tapas restaurant, just saying). PS: Is there a name for this phenomenon, the one where once you become aware of something, you spot them everywhere. Once I discovered Peppadews, I’ve seen them everywhere, including the deli section at Safeway. I love peppadews too! A while back, I stuffed a bunch of peppadews with some homemade crab salad (fresh, real crabmeat, mayo, finely diced celery or scallions, and some spices). Took them to a potluck and they went over very well. Recently, I started adding a few sliced up peppadews to my hot dogs for an interesting new twist – not bad at all! They might also make a pretty good as a garnish on tacos (a nice contrast to the mexican pink pickled onions). Peppadews are also available as an add-on topping for pizzas at Campagnola Roma. Me-N-Ed's pizza puts them on their Sicilian Sausage pizza (they call them “sweet cherry peppers”), however you can add or substitute them on any of their pizzas.